Chartres cathedral also known as Cathedral of Our Lady of Chartres or Notre-Dame de Chartres is one of the finest architecture example of High Gothic style in France, still well preserved and listed on UNESCO World Heritage since 1979. You could still nowadays observe the sculpture designs and its details as they were seen from the day they were built. Many people come here for various purposes, not only for religious reason. Many of them come here to study or do a research for medieval architectures and the stained glass windows. Or simply because they adore the historic buildings. 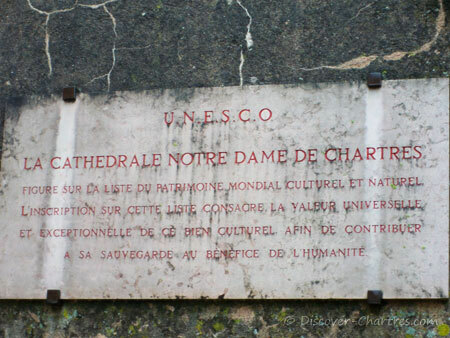 That is why Chartres cathedral becomes the most visited place in Chartres and in whole department of Eure et Loir. Visiting the cathedral is a must thing to do while you are in Chartres. What to see in Chartres cathedral? Notre Dame de Chartres has two different styles of towers – Gothic style on the north side with 113 meters high and roman style on the south with 105 meters high. Both towers are absolutely the highest peaks in the region which can be seen from many miles away from Chartres. Each elements of the cathedral such as the stained glass windows, the labyrinth, the statues, the details architecture have drawn a huge intention of visitors. 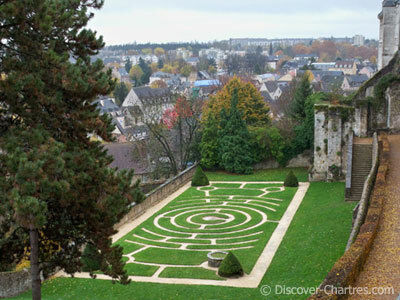 Not to mention the labyrinth garden situated in the backyard of the cathedral. Chartres cathedral towers, of course… you will see the different style of both towers of 12th century, with the rose window. The facade - royal portal of 12th century, north and south portals of 13th century. You could observe the details sculptures and statues on the exterior decoration of the cathedral. The astronomical clock of 15th century with its unique hand. The nave buttresses and flying buttresses, you could find this part on the east side of the cathedral. Jardin de l'Évêché - the Bishops Palace Garden, where you could enjoy the beautiful panoramic view over the old city basse ville and the labyrinth garden of 18th century. The labyrinth in the central nave, one of the biggest one ever built in French cathedrals. Discover the central nave and the aisles, the choir and the chapels. The stained glass windows…well of course… Chartres cathedral has hundreds of stained glass windows which decorate all around the interior of it. Some myths believe that nowadays people cannot create the same blue color which dominate the color of the stained glass windows. That’s why you will hear often the words Chartres Blue. Another part of the cathedral that you should visit is the crypt, beneath the Cathédrale Notre-Dame de Chartres, is the largest one in France. Climb up to the north tower and enjoy the surrounding landscape. I visit the cathedral very often… I think it is a beautiful object for photography. Every single element worth photographing. I myself am not a professional nor an amateur photographer... I am just so passionate about it. Do you want the famous west facade and its towers, from top to ground level will be your object of your image? Consider to bring a wide lens. A tripod could be useful if you wish to photograph the interior decoration. And also... never forget your battery backup. If you wish to photograph the stained glass windows, best time to visit the cathedral is before the sunset. You will have more sunlight reflection on the glass at this time, so you can see the stained glass details more clearly. 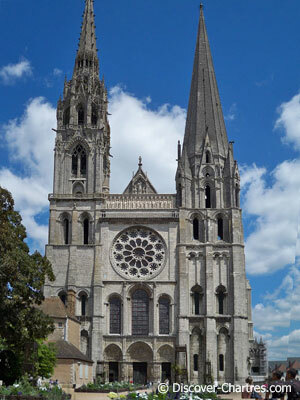 In all case, be sure to check out Chartres Cathedral Visit Guide to know guide types and the ticket price, then decide whether you should need a guide or you prefer to discover the cathedral on your own.